As we are approaching the holidays it gets harder and harder to give Temptation "the slip". With all the visual temptation surrounding us at work, on the TV, on the radio and everywhere we shop....much less the treats we create ostensibly to give to our friends and family, we are suffering a cacophony of visual "feed me"s at every turn. How can we help keep ourselves distracted so we don't let Temptation win? A friend recently forwarded me (thanks Cindy!) an online article from Realage.com that provides some good activities and distractions to help us through the holiday food crazies. Practice mindful meditation. Spend just 7 minutes a day focusing on recognizing, accepting, and experiencing your cravings rather than trying to ignore or suppress them. Dieters who do have far fewer food cravings, and resist them better. Here's the trick to eating mindfully so you'll eat less. Get on your feet. Especially if you're craving chocolate. A quick walk will curb even major chocoholic cravings in just 15 minutes. It works by stimulating feel-good brain chemicals and feeding your spirit. Hit the mute button and do sit-ups -- or this -- when commercials come on. You'll switch off cravings, too. Adults (and kids) eat more snack foods after watching TV shows loaded with food ads. Try yoga. Aside from making you stronger, suppler, and calmer, yoga helps you tune in to your appetite and recognize whether you're actually hungry or just bored. Do this simple sun salutation series for a nice workout. Have that little cookie you can't stop thinking about. Sometimes, trying to stifle a craving makes it grow so intense that, when you finally cave, you eat the whole bag. Yep, having one little banana-oatmeal-walnut cookie now may save you from having 30 later. Don't beat yourself up. Relish it. Take a small bite, savor the taste, have another bite. Thoroughly enjoy it. Then move on. Hope this helps. I plan on being an active user of these proactive tips to thwart Temptation this holiday season! 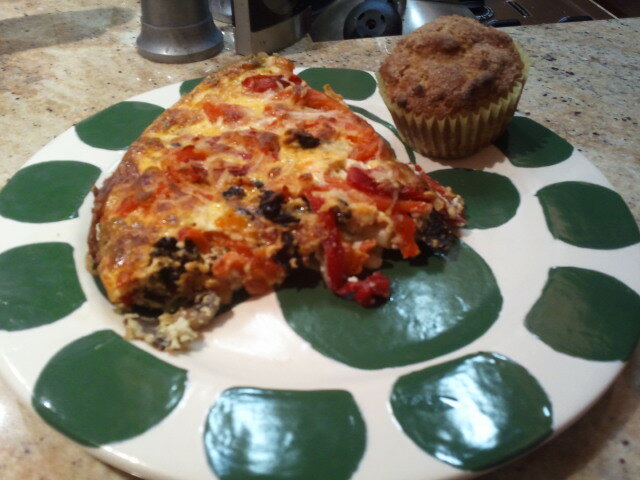 I first had frittatas when I was in the Peace Corps. There were Spanish nuns who lived across the way from me who taught me many things. 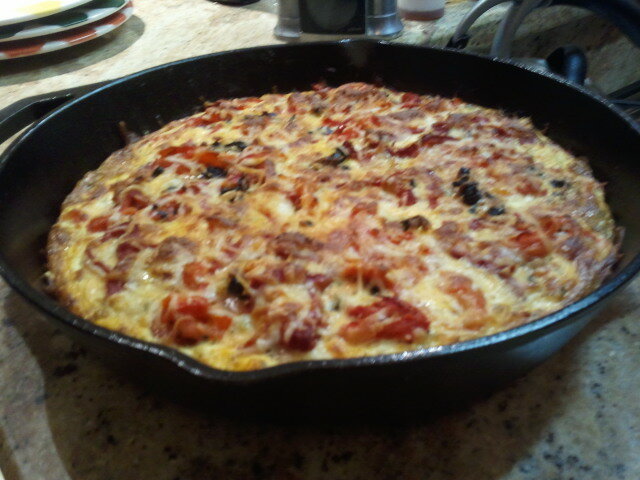 One thing they taught me was that frittatas are a great portable food. You can put just about anything in them so they can be a compete food source. Once cooked, they can be cut in wedges, wrapped and packed for picnics. Back in those days, the base of the frittata was thin slices of potato. Although yummy, I have since found it it an unnecessary addition. Instead I have now find many recipes that include low fat cheeses and lots of different kinds of vegetables. The most recent frittata recipe I tried out was called a Layered Mediterranean Egg Bake. What I found very appealing about it was the use of dried tomato paired with feta & ricotta cheese. That combination provides a wonderful rich flavor. My husband really liked it too. Frittatas are an easy meal to fix. A health one dish meal so the clean up is pretty easy too. They can be served for breakfast, lunch or dinner...and as I mentioned at the beginning of this post, they can also be packed for picnics! And when you are tired out from a holiday it can even serve as a simple, healthier, comfort food. For a meal, you can add a tossed green salad or fresh berries along with a fresh baked muffin. They are a good option when you have friends over to eat, too. Can't beat this protein rich meal! ...not only does exercise reduce your risk of getting the most deadly diseases, it also improves the outcome if you do develop disease. Thanksgiving is a moment in time to remind us to think and act on the many reasons for which we can be thankful. I found this quote in a great book, Thanks!, by Robert A. Emmons, Ph.D. 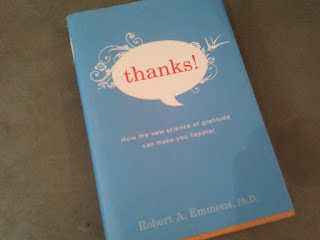 This is such an amazing book illustrating the power of gratitude in our own lives and the lives of those around us from our family and friends to those we work with or merely interact with. I started a journal of gratitude four years ago. Once I started thinking about it, it was stunning to me how many things I am truly grateful for from the very simple to the much more complex. On this day of Thanksgiving. I want to thank all of you who have chosen to read my blog, encouraging me to continue by journey and share it with you. Because of you, I am a healthier, happier person today! Since this is the time of year we can enjoy all the many squashes that are available I thought sharing a tip on how to easily peel a butternut squash might come in handy. Some squash, like zucchini and yellow crookneck do not need peeling. Acorn and spaghetti squash we prepare by baking and then scooping out the insides. 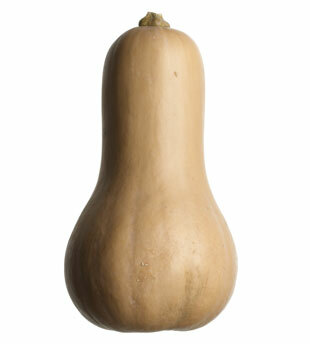 In thinking about it, butternut squash seems to be the only one we routinely peel when using in a recipe. The challenge is it's thick skin. This process will make quick work of peeling your butternut squash, making it easier to do and more desirable to use in recipes on a regular basis. I have a friend that needs to eat gluten-free. This makes cooking treats a little more challenging. This is partly due to not automatically having the right ingredients on hand when the moment seizes you to bake. There is also the challenge of finding recipes that are tasty and reasonably doable. For those watching portions and calories, inevitably the recipes do not have those included. We went to our friend's house on Saturday night so I thought this was a great time to research a cookie I could bake, with my daughter's help, that would be tasty, easy and one I could figure out calories for per cookie. What I found was Nikki's Healthy Cookie Recipe on 101cookbooks.com. This is actually a vegan recipe too because it uses no egg. Instead you use 3 ripe bananas. It has other yummy ingredients like shredded coconut, rolled oats, dark chocolate chips and a little almond meal. It calls for coconut oil but I used the olive oil alternative which worked just fine. They were easy to assemble and as luck would have it I had all ingredients on hand. Once baked, my husband, daughter and I all had a cookie and each of us thought they were delicious. Definitely a repeat. They are not a good cookie to hike with or mail as they are a little on the delicate side. We were able to make 44 cookies from the batter. With that amount of cookies we figured each cookie was 64 calories. Not bad for all the delicious ingredients included in the recipe. Now instead of the standard wine we take to their house, we are taking fresh baked cookies! Okay, so it seems when I first start concentrating on something it backfires. That old knee jerk reaction of setting myself up for failure comes charging back into my life. Little voices in my head start saying a phrase I have heard many times before- "You don't really think you can do this, do you?" The good news is, I do feel I can do this, this time around....just not with out some fits and starts. This past week I was way too over indulgent. Birthdays do that to me. My daughter's 24th birthday was on Monday. We celebrated with a dinner party for her on Saturday. That is when the eating began. Her menu is always- Fried Chicken (the real homemade kind), mashed potatoes and gravy, green beans with ham hocks, with the ultimate prize being a from scratch German Chocolate Cake with french vanilla ice cream. Holly smokes! It was all delicious mind you, even if I do say so myself. I have gotten better about fixing less of everything so there are not too many leftovers. I also only make this meal once a year, for my daughter's birthday. I gained 3 pounds. Yipes! Then the excuses kept piling up as I ate a little more than I should have each day...and drank red wine. I am so good at that! Fortunately, my good-to-me voice started getting louder and louder saying- "you don't really need this extra food and you really do want to succeed!" So I am slowly getting back on track. The only way I really know how to get back on track, with complete honesty and knowledge of what I am doing, is to track what I am eating, counting portions and calories. Yes, it is a bit of a nuisance, but I don't have the kind of eyes or mind that automatically knows what are the "right" amounts to eat. So I have started logging my food again. I started yesterday...went way over 1800 calories, but at least I counted and had to recognize what I was doing. Counting does shock you back to reality. In order to control what I am eating through the holidays, I am going to have to log everything this year. I may even be able to lose a net couple of pounds from my low last week before Christmas. What would be really cool is not to gain any weight through New Year's. That would be a first! That way, when the New Year begins and I am ready to really work on losing weight, I could start in a better place, bringing my weight down a net 10 lbs which is my goal as I look to next summer and doing my first 30 mile ride! If anyone has some good insight or advise to share, I would love to hear it! I know I am not alone in this journey! Substitute hot tea for my red wine in the evenings (cold beer isn't working now because of the cold weather outside)--this will be my hardest challenge! I met with my trainer yesterday. I wrote this summer that I wanted to have my final two training sessions for the year before the holidays. I just love having sessions with her. She is so motivating and keeps introducing me to new routines which keeps me interested in working out. My goal for these next two sessions was to learn how to spin. I want to work on my endurance as well as focus on figuring out how to burn more calories as I work on losing more weight. Why, you ask, might I want to learn how to spin? Ultimately, I have as a goal doing a 30 mile bike ride next summer. In order to do this I need to lose a little more weight (at least 10 lbs.) and continue to build up my endurance. be bad becasue it involuntarily breaks the wheel due to friction. peddling so you can adjust the tension up or down depending on the instructor is requesting you do. KEY THING TO KNOW: The resistance knob is also the brake. I tried it out and liked it. The most exciting thing for me was seeing that I could stand and peddle without any difficulty. When I try to do this on my outdoor bike I am not successful. My trainer said that by doing the standing and peddling in class I should be able to translate this new ability to my biking outdoors. I am encouraged by this possibility. My trainer said I should probably have as an initial goal completing only 30 minutes of the hour class t and then work up from there. Since I figure the folks in the class are undoubtedly already slimmer and trimmer than I am, I know this will be a challenge for me not to feel too self conscious. Most exercising I have ever done has be a lone. I don't tend to be a group participator. This will be a good new challenge for me. There are two camps regarding leftovers....those that love them and those that hate them. I am one that loves them...if they are my leftovers! So why is it that I love leftovers? 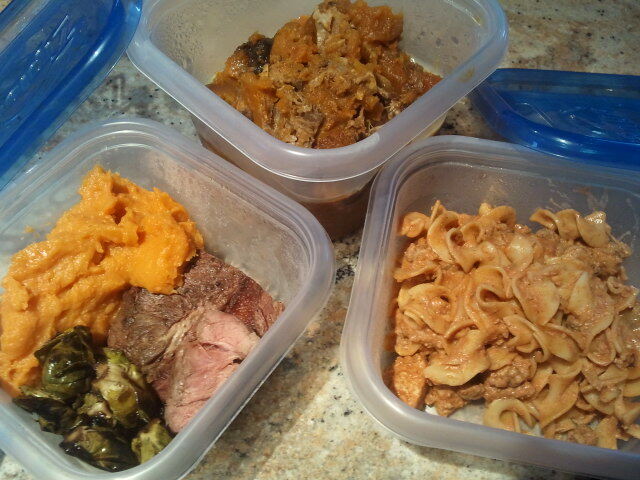 Well, leftovers are first and foremost very convenient. In our busy, hectic lives it is nice to have something to eat that is ready to go. Mine are pre-packaged and measured so all I have to do is plop it on a plate and, if desired, heat it for a couple of minutes in a microwave. I also like the fact that I control how my food is prepared. Going out to eat or grabbing something prepackaged to eat means that there are ingredients in your meal that don't need to be there and may be harmful to your health like salt, corn syrup, coloring with dyes, added fats, and various preservatives. When you cook it none of those ingredients need to be included. What is appealing to me too is that I am leveraging the effort of preparing home cooked meals for multiple people and multiple meals. The time spent in the kitchen counts for many meals. For those who don't like spending more time in the kitchen than they need to, this is a real plus. Another reason I like eating leftovers is that they can really save you money. Your meal costs a fraction of what it would if you went out to a restaurant, even a fast food one. These days as we are counting our pennies and prioritizing what we need or want to spend our money on, eating leftovers is a no brainer. Finally, leftovers taste that much better when you realize the time you are saving not preparing another meal or going out to eat one. The time saved can be used to check in with a friend or for taking a midday walk. Both options being an added plus to our hearts and health. I am having so much fun baking with pumpkin. I was never a great lover of pumpkin pie. Don't get me wrong, I always enjoyed my piece at Thanksgiving but it was not something I looked forward to or found the means to have it more than once over the holidays. Now I am discovering that I love the flavor! I especially love it with Pumpkin Pie Spice. It is also heavenly to smell as the latest recipe is baking in the oven! I tried out a Pumpkin Cupcake recipe from SkinnyTaste.com which were fun to fix for by Fall Chili Supper. They looked good and smelled heavenly but there were mixed opinions about the taste. I thought they were a little gummy. I intend to keep looking for a better cupcake recipe. Next I tried out an Oatmeal, Dark Chocolate Pumpkin muffin recipe from fitsugar.com. I made this recipe with a friend in mind. She loves things with chocolate in them. These have dark chocolate chips which makes them healthier, especially since the recipe is also made with whole wheat flour, old fashioned oats and walnuts. These are tasty but, as you might imagine with the listed ingredients, fairly dense. They definitely "stick to you ribs" but good for cold weather. This week I tried out a lighter looking muffin recipe. It also has the least calories of 145 per muffin. 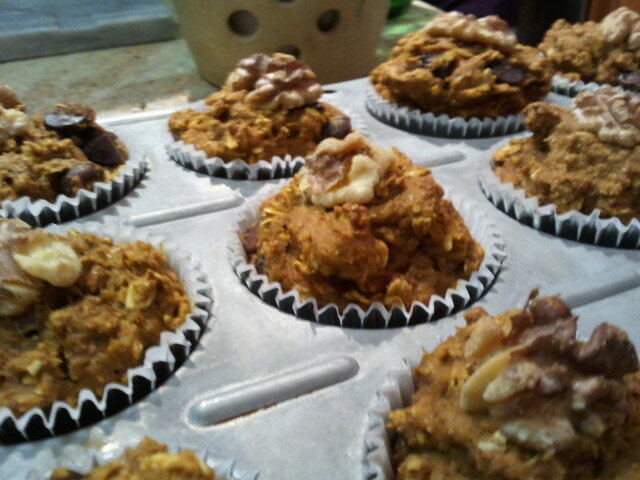 This simple Pumpkin muffin can be found in myrecipes.com. 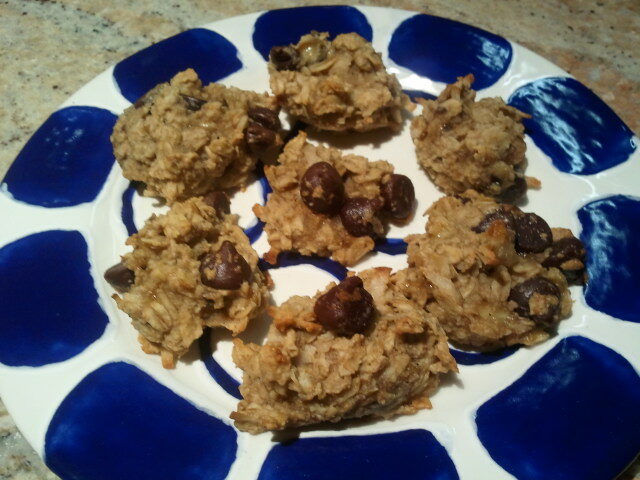 These were light and airy, even though it does have a 1/2 cup whole wheat flour in it. These were a big hit and I plan on baking them again.A similar recipe which looks good but not as healthy for a simple Pumpkin muffin I also found in myrecipes.com. Next I plan on trying out a Pumpkin-Cranberry muffin recipe--myrecipes.com. This one I expect to be a hit while still being pretty healthy and under 200 calories. I will let you know what I think! It has been a good week. I lost 2.2lbs from my low in July. Means I have 6 more pounds to go by Thanksgiving. It feels so much better to be on the downward swing. I am going to continue to work on these action items, trying to be particularly mindful during the weekend. This will be especially hard since my daughter's birthday dinner is tomorrow night. A good challenge to see how well I can do! Our Hunter-Gatherer Genetics Are Working Against Us! My major in college was Social Anthropology and African Studies. I was always fascinated by the rituals surrounding the Hunter. Any time a big kill occurred, no matter whether it was an historical account or one occurring in modern times, there was a gorging on the meat harvested from the kill. There are also those times of year when there are the big harvests of food, provided by the Gatherer, which created a reason to celebrate and enjoy the bounty culminating in annual celebrations. Our bodies are built to gorge. Since we never knew when the next meal might come, we gorge on what was in front of us so our bodies could stock up and sustain themselves through the leaner times. Nothing went to waste. Since we now live in a world of plenty (most of us in the developed world, that is) our capacity and genetics for gorging are now working against us. What comes naturally is now not what is healthy for us. We have to consciously and mindfully make choices and not let our instincts drive our decisions. As the O'Keefes state in their book The Forever Young Diet & Lifestyle, "As adults we are 'hard-wired' to move only when we have to, to rest when we can, and to eat as much as possible whenever food is available. Those instincts served us well in an untamed world where we had to save our energy in order to secure food, water, and shelter and withstand frequent periods of scarcity." Today those instincts doom us to "a sub-optimal life that includes obesity and illness". So, not only is it the super-sized world around us we have to keep at bay, but also our own genetics! There is no free pass. The only way to combat the desire to "live for today" and to be a member of the "clean plate" team is to live an intentional and mindful life. There is actually a whole movement out there called "mindful eating". It seems like a drag to always have to be planning what we eat and being mindful about what we put in our mouths. Sometimes I am just not in the mood! But I have a thought I am wanting to test out. What if we were mindful the majority of the time but still allowed ourselves the occasional blow-out? Could we maintain our weight that way, not let go of the overall control of our lives and also satisfy our instincts? I am thinking this could be a good solution. The trick is to find balance and not get into the cycle of overindulgence. I know I have not yet struck the perfect balance between living in the present and acknowledging my hunter-gatherer genetics. It is a challenge I am enjoying taking on, however. It appeals to me--acknowledging all of me. As I am watching Christmas ads on TV and it is only November 9, I am humbled by the task of not giving into a season of gorging but instead making it just one or two days- Thanksgiving and Christmas. This is going to take a lot of mindfulness! We had a great dinner last night. 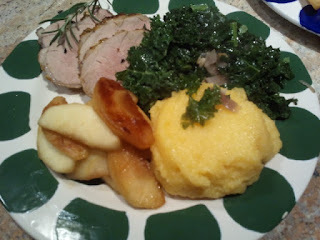 The menu consisted of Maple Mustard Pork Tenderloin with Caramelized Apples, Sauteed Kale in garlic, onion and chicken broth and Soft Polenta. This time of year I love adding roasts to my menus. Pork is a lean meat and easy to prepare. This is a delicious recipe. This was a good meal for Super Foods. Apples are plentiful this time of year and in so many varieties. This recipe calls for Granny Smith apples. Apples are low in calories, high in soluble fiber, which helps lower cholesterol and protects us from a whole host of diseases. Kale is a cruciferous vegetable packed full of vitamins and cancer fighting benefits. It is considered the "Queen of the Greens". We prepare it the same way we do sauteed spinach. This is a super easy way to cook a vegetable. The polenta was made from cornmeal. Very economical and easy to do. We discovered, however, that it is pretty tasteless on its own. Next time we plan to sauteed some onion and garlic with some mushrooms to add to the polenta as it cooks. Without adding many calories, I think we will add more taste and a more attractive look. As I think I mentioned in a previous blog, my middle son has challenged us to eat vegetarian at least two times a week. It is better for our health and also better for our environment. Last night we kept to the pledge and I made a delicious soup. It was one I had not done before. It was out of the 1998 Cooking Light Cookbook. 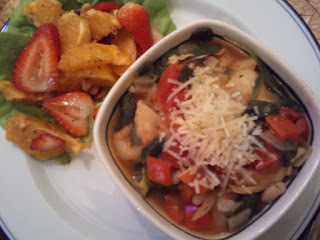 It is called Tortellini, White Bean and Spinach Soup (tortellini-white-bean-spinach-soup). It is packed full of ingredients from the cheese-filled tortellini, beans and spinach to onion and artichoke hearts. It is more like an Italian stew than a soup. Consequently, it is very satisfying. We paired the soup with a Marinated Orange and Strawberry salad (Marinated Orange & Strawberry Salad recipe). I found this recipe in the Complete Cooking Light Cookbook. It went quite well with the soup. As you can see by the photo, it was a visually appealing meal. The soup and salad combined was 388 calories. A piece of hearty bread could have been added and still been within the range of a 500 calorie meal. I plan to do that next time. I have added the links I found on line to the recipes so you can try this combo out as well and let me know what you think! Bon Appétit! I have come to realize that with managing my weight I really have two challenges going on simultaneously. There is the desire to lose weight and there is the desire to keep weight off. These are, obviously, not mutually exclusive objectives....but they seem that way at times. The reality is that since the end of July I have not lost any net weight. In fact, the struggle has been to keep the weight off I have lost. As of November 1 I was up .4 lbs from July 31. Today I am down .4 from July 31st. Overall this means I am 50 lbs down from my absolute high a year ago and 25.2 lbs. down from this January. I seem to go up and down about 4 to 5 lbs. A good thing but not the best thing. With my goal to lose 2 lbs. a month, I should be down another 8 lbs. from July by the end of November. There is a lot in my world I still don't deal with very well. When I am at home, managing my own meals I am much more in control. When I travel, which I have done a lot of since July, I am not so good. When I get sick, which I did recently, I go for comfort food and inactivity. Let's be real, I love any excuse to pamper myself. And, unfortunately, pampering to me often means an extra glass of wine, comfort food from my childhood, stopping off at that favorite bakery when I am visiting back in my hometown or having an appetizer or dessert when I am out to dinner with friends or family. I am a firm believer there is a balance between denying myself the pleasures I enjoy and over indulging with the consequence of gaining weight and feeling bad both mentally and physically. And I also have the additional need to lose more weight. So what is stopping me? Why am I stuck and not able to lose more weight? Am I basking too long in my 50 lbs. loss? Am I truly lazy? Where is the motivation I need? And why am I ignoring the goals I set out for myself...especially since I thought they were reasonable...and, after all, they were goals I set, not goals somebody else gave me. In the book Predictably Irrational the author, Dan Ariely, discusses this very conundrum we all struggle with. He states, "Resisting temptation and instilling self-control are general human goals, and repeatedly failing to achieve them is a source of much of our misery." He believes our only means to combat this predicament of repetitive failure is to make "pre-commitments" to ourselves. He says "...the best course might be to give people an opportunity to commit up front to their preferred path of action." But our preferred path may not be very easy or pleasant so how do we get ourselves to do the right things? Ariely suggests "By pairing something that we love with something that we dislike but that is good for us, we might be able to harness desire with outcome-- and thus overcome some of the problem with self-control we face everyday." In other words, it is not just enough that we want something, we have to help ourselves through planning and positive reinforcement. Sounds to me like I need to act as a parent to myself! My internal "truth gauge" is telling me he is right. My current strategy is to lose 8 lbs by the end of November. This means no giving into over indulgence, including at Thanksgiving. For every 2 lbs I lose I am going to put $20 into my piggy bank for buying an IPad. I really plan on putting money in an jar. And I know it it going to take a while, but that is the point! How am I going to keep myself honest? By exercising at least 1/2 hour each day, preferably at the "Y" and with weights. I am also going to set up time with my trainer to learn the "art of Spinning" to help with the calorie burn. I am going to go back to logging everything I eat as well as my exercise. And I am going to give weekly updates to the blog on my progress. Let's hope this is the ticket to changing habits and achieving success! Now that we are thoroughly depressed and coming down from our sugar high from last night, I thought I would share my insights on my "Life with Candy". As I mentioned to you in a previous blog, My mom was notorious for hiding sweets...well she also always had Butterfingers in the freezer, her favorite candy. Needless to say, I depleted her supply of Butterfingers regularly and over many years. It was a great game. I also loved the "candy holidays" like Christmas, Valentine's Day and Halloween...especially Halloween. I loved all the chocolate candies, particularly the Pumpkin shaped Reese's Peanut Butter Cups. When the kids were little and still Trick or Treated I would relish the moment of going through their leftover candy to find my favorite candies before throwing the rest away. I also had the horrible habit of buying the candies I loved most for the Trick or Treaters that came to our door. I would always sneak a few for myself, of course! Some how over the years I got in the habit of having seasonal candies, like Reese's miniature cups in Fall colored foils, in bowls about the house. My excuse was that it was festive, welcoming, and something to offer the guests we would have over during those seasons. The reality was that I was the one who ate most of them. Fortunately, my children never developed the need for these candies. Then overtime one season melded into another and I seemed to have candies out all the time, refilling the bowls regularly. It wasn't until a friend mentioned to me that she noticed how I always had candy around and she wondered how I could do that and still be focused on watching my weight. Well, my loving friend really knew the answer-- I couldn't! That next week I got rid of the candy and filled the bowls with shelled pistachio nuts! Not surprisingly, those nuts are still sitting in the same bowls, about at the same level. It has made a world of difference in my candy grazing. This year I wondered a lot about what I should do about getting candy for Halloween. We haven't had Trick or Treaters once since we moved to our condo. There really was no need for me to buy any. I had to wrestle with my weak desires a couple of times. How to not have candies around and yet avoid my feeling deprived. I really wanted to avoid an excuse to binge. Well I went to the grocery store yesterday and spent a few minutes in the candy isle thinking about it; touching, holding and looking at a variety of bags of candy. Even put a couple in my grocery cart. Ultimately I decided I wanted "one" of something not a bag of something....a good step, I thought, so I put the bags of candy back. There were no single candies at the grocery store....but I didn't really want to go to another store to look for candy. So I landed in the ice cream isle. 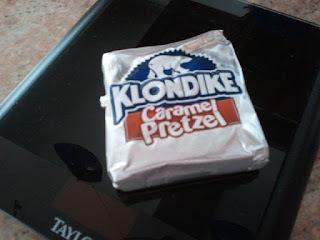 I got pretzel and caramel flavored Klondike bars. I figured my daughter and husband could also enjoy one after dinner, there would only be a couple bars leftover and they would be in the freezer, frozen and out of sight! Really glad to not have any leftover candy to eat or hide! It was a fun treat. I enjoyed it. The good news is-- I didn't gain weight, I didn't binge, nor suffer from a sugar high. I also didn't feel sick or get depressed because I had failed myself again. Most importantly, I didn't deprive myself and yet I managed to morph a bad, debilitating, unhealthy tradition into something memorable and satisfying. Only 270 calories compared to the thousands I know I have eaten in the past! Phew!